The attractive A1 Call Box combines a unique design and rugged durability with a self-closing door, which is ideally suited for outdoor use where harsh weather conditions or corrosive chemicals may require a protective housing. Also compact enough for use indoors in entranceways and hallways. 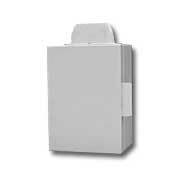 The Solar A1 Call Box can be flush mounted to a wall or bracketed to a pole. Locating this unit throughout a facility can save on manpower and improve emergency response time. It's field programmable to allow voice messages to be easily changed for special events. This solar-powered Call Box mounts on a wall, PVC or aluminum stanchion. The aluminum enclosure has a white powder-coating, is .090 inches thick and measures 13"H x 9.5"W x 6.5"D. Perfect for indoor and outdoor use, this Call Box provides protection against dust and falling rain. It includes an antenna and set of small reflective decals.